4 Matcha Recipes That'll Make You Love Matcha More - Get Healthy With Valentina! Shake coconut water and matcha together in a martini shaker (or a bottle), pour over ice and add a squirt of lime. Add some lime slices. Enjoy! Preheat oven to 350 degrees. Spray tin with non-stick cooking spray or line 12 muffin tins with silicone or foil liners. Place the oats in the food processor and pulse for about 10 seconds. Add remaining ingredients to the food processor. Process until everything is mixed together and oats are smooth. Divide batter among cupcake liners, and bake for 18-20 minutes, or until toothpick comes out clean. First mix the vanilla powder and the agave nectar. In a cup, add green tea powder. And add hot water, 2 tablespoons. Whisk carefully until green tea powder is completely dissolved. If you pour the water all at once, there will be green tea powder lumps, which is the least wanted here. Then add the agave and vanilla mix and stir until combined. Now froth the simmering milk. If you don’t have a frother, you can pour it into a jar: fill your jar with more no more than halfway full so there’s room to make some foam. Shake the jar with the lid on. Take the lid off the jar. And heat the milk. Add milk foam into green tea. Dust with cinnamon and serve. Enjoy! Add matcha to Greek yogurt and mix. Add berries to a cup. Then add the yogurt. Top with more berries and a drizzle of agave. And Enjoy! 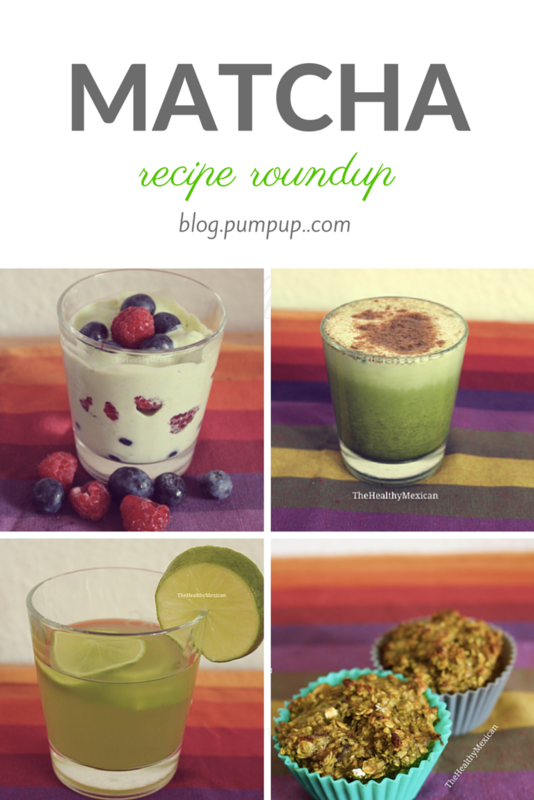 These matcha recipes are part of a series of monthly posts by Valentina M. Follow her on Instagram @thehealthymexican9 and on PumpUp @thehealthymexican.